of heels against stage floors…1″ These were the words used for an advertisement for the 2000 TIMC Fiesta Garibaldi. Words that continue to resonate today, to describe the event thousands of people enjoy. Join us for the all-day festivities of art, culture and food. Fiesta Garibaldi is a traditional re-creation of the sights and sounds of the Garibaldi Plaza in Mexico City. The festival is an all-day event from 11 in the morning until 11 in the evening. 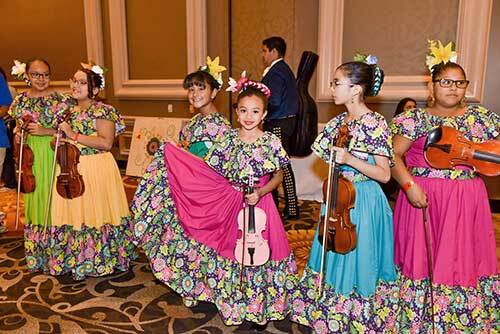 With live mariachi music and baile Folklórico acts on two venues (indoor and outdoor stages). 1. 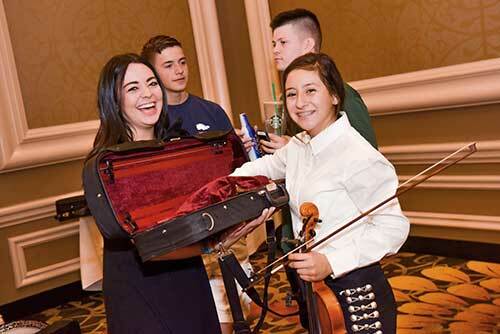 Rodríguez, Gregory S. The History of the Tucson International Mariachi Conference. Tucson: The University of Arizona Mexican American Studies & Research Center, 2000. Experience the Garibaldi Food Vendors! If you plan to attend Fiesta Garibaldi, which is an 11 hour event, you are going to get Hungry! The food vendors offer many choices for your enjoyment. Hot Dogs (Sonoran style) to burritos, carne asada, tacos and much more. Also refreshing drinks from sodas to aguas frescas, lemonade and snow cones are available. Do not miss out on Los Changuitos Feos de Tucson Taco Booth. The Changos tacos are now famous and a tradition at Fiesta Garibaldi. Just try walking by the food vendors booths and smelling the aromas of fresh food being prepared all day long. Get there early before you miss out! For the last two years the food vendors have been selling out of their product. Thank you! Come join us in this wonderful celebration of music, dance and culture. Bring your family and spend the day playing in the pool and listening to Mariachi music in the background. See the many items that the artisan vendors have to sell like jewelry, dresses, southwestern crafts, leather goods and much more. Come join us and take away memories of good times, people, music and food! Purchase Tickets on-site at the Door!